On this all-in-one 7-day package, we’ve arranged your hotel reservations, sightseeing, transportation, daily breakfasts and connection between cities. Plus a one-of-a-kind feature is our Monograms Local Host®, there for you in both cities throughout your stays, ensuring everything runs smoothly and you get the most of your trip. Your vacation starts the moment you arrive, as we can seamlessly get you from baggage claim to your selected hotel. There, you’ll meet your Local Host, who will provide a welcome greeting and a set of materials to help you get settled and personalize your vacation. The next morning, after your included breakfast, we’ll pick you up at your hotel for your exclusive sightseeing, a half-day excursion with an expert local guide. You’ll hear the inside story of must-see sights like Big Ben, and Buckingham Palace in London, as well as arranging perfect timing to see the changing of the guard and an inside visit to St. Paul’s Cathedral. In Paris, we include inside visits to Notre Dame and the Louvre (Louvre replaced with Seine cruise on Tuesdays). And never fear—we’ve scouted the city’s best vantage point to view the Eiffel Tower. Each of your inside visits include our exclusive VIP access, so you skip the lines. After all, why not spend your time inside the attraction rather than outside with the tourists? And on the third day in each city, choose to explore on your own (with our Local Host support, of course), or take advantage of one of over 60 special activities & excursions to suit your interests. Prime seats to a West End show, perhaps? 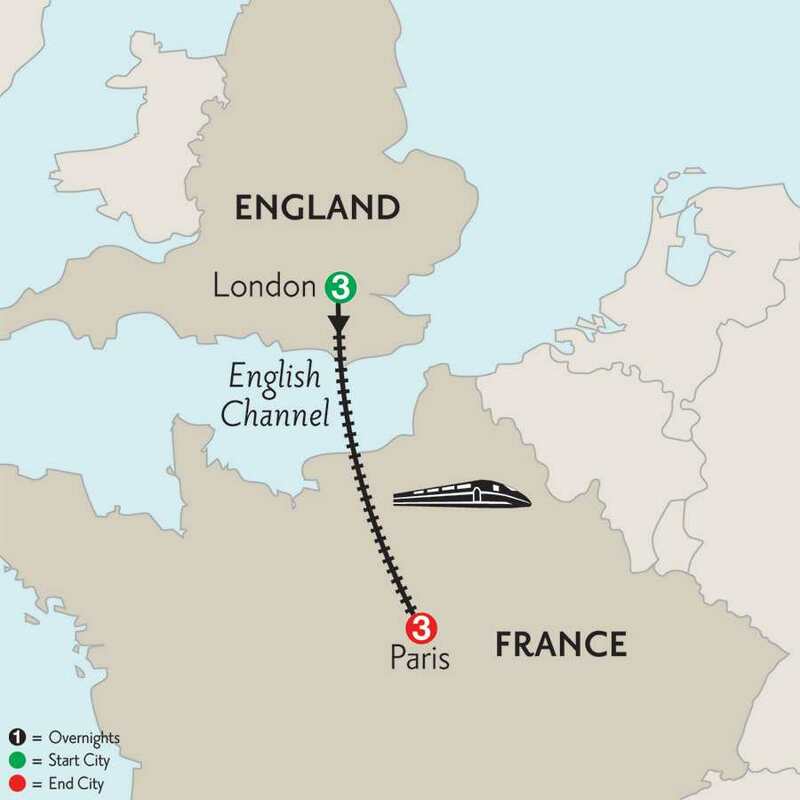 All Monograms packages with London and Paris are connected with included tickets on the famous Eurostar high-speed train. We also include the transfers to and from your hotel to both train stations. In total, this is a value of over $380 per person. And on top of that, we’ll even ensure you get right to your reserved seat. Welcome to London! Your Local Hosts will help you maximize your stay in one of the world’s most cosmopolitan cities. Morning guided sightseeing includes all of London’s famous landmarks. Drive past the Houses of Parliament and Big Ben; Westminster Abbey, where Prince William and Kate Middleton were married; Whitehall’s mounted horseguards; the Prime Minister’s Downing Street; and Piccadilly Circus. Take photographs of the London Eye, the giant Ferris wheel situated on the riverbank, and the Shard, the tallest building in Western Europe. Visit ST. PAUL’S CATHEDRAL (except on Sundays). Sir Christopher Wren’s masterpiece with its world-famous dome is an iconic feature of London’s skyline, and the awe-inspiring interior holds fascinating stories about its history. The final highlight is the ceremonial pageantry of the Changing of the Guard (if held). Your Local Hosts will have interesting suggestions for your day at leisure—a visit to the Churchill Museum & Cabinet War Rooms, the secret underground headquarters during World War II, or to the Wimbledon Lawn & Tennis Museum. Later, why not enjoy an acclaimed West End show? Morning guided sightseeing takes you to NOTRE DAME CATHEDRAL, where Napoleon was crowned emperor in 1804, to admire its amazing 13th-century, stained-glass Rose Window. Pass the Latin Quarter, Les Invalides, the Opéra, Place de la Concorde, and Arc de Triomphe. Drive by the Seine River with its beautiful bridges, and along the fashionable Champs-Elysées. Stop to take photos of the iconic Eiffel Tower from one of the best panoramic viewing points. Also enter the world’s most visited museum, THE LOUVRE with its modern glass pyramid, to see Da Vinci’s Mona Lisa and other treasures (Louvre replaced with Seine cruise on Tuesdays). During your day at leisure in the “City of Light,” your Local Host can offer many ideas, like a visit to a local food market and cooking lesson; where to taste the best crêpes and pain au chocolat; a trip to Louis XIV’s Versailles; or a walking route through Père Lachaise Cemetery with its tombs of Jim Morrison, Oscar Wilde, and Chopin.